Description: Brown rectangular strip of bacon with a long, thin off-white fatty strip (heat-stamped) in the middle and a thin fatty strip on the side. Back of the bacon is marked, "KOREA". Measures 3-1/8" long x 7/8" wide x 1/8" thick. 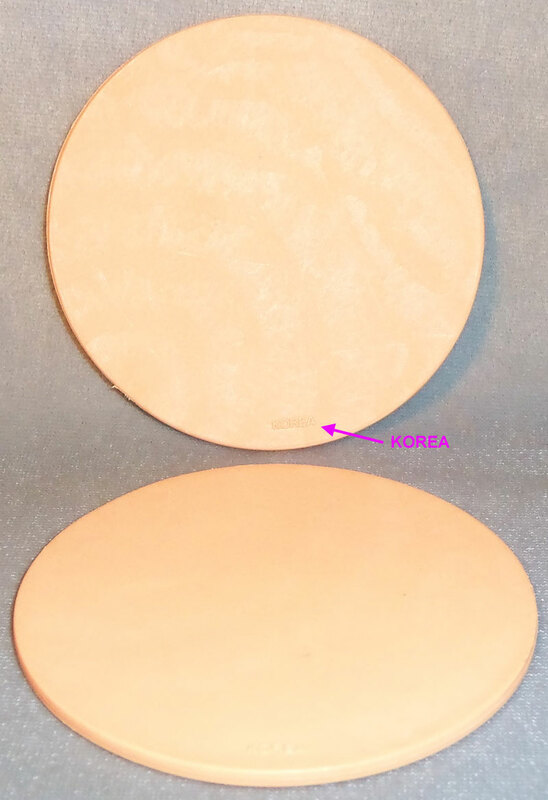 Description: Round light pink plastic slice of bologna. 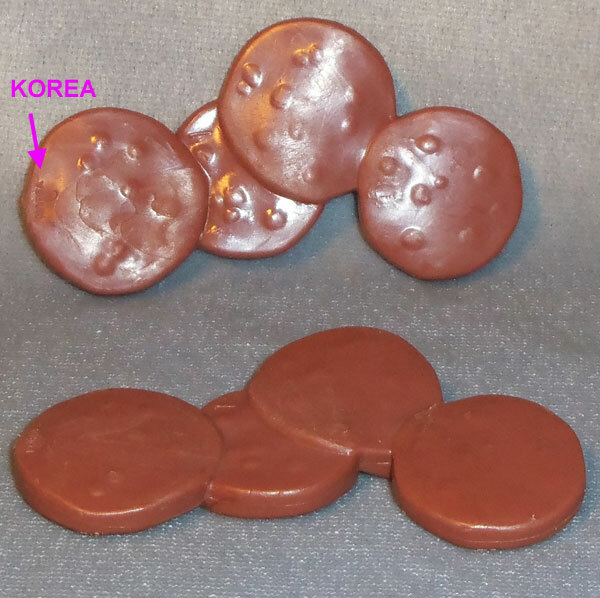 One side has a small imprint marked, "KOREA". Measures 2-7/8" diameter x 1-1/6" thick. Description: Light brown fried chicken drumstick (leg). The drumstick is 2 halves molded together with a visable seam. The drumstick is textured with ripples to look like a real piece of fried chicken. Measures 4-1/4" long. Description: White / Light brown fried chicken drumstick (leg). The drumstick is 2 halves molded together with a visable seam. The drumstick is textured with ripples to look like a real piece of fried chicken. White chicken drumstick appear "cooked" (light brown) when dunked into ice cold water. 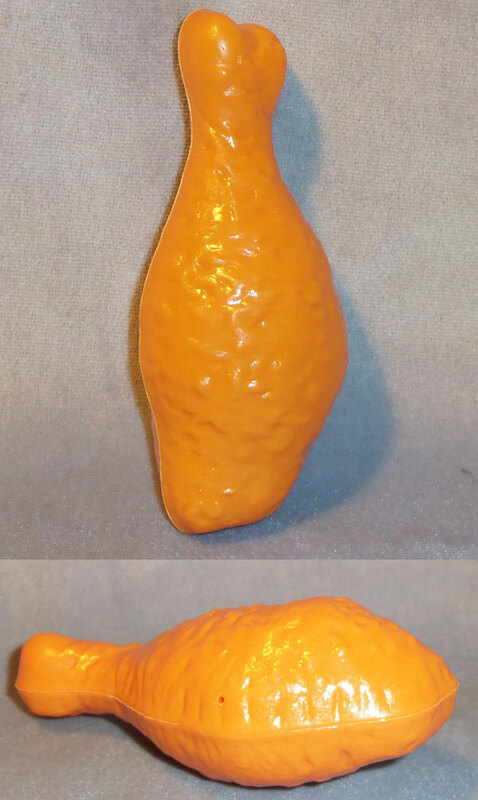 Same size/shape as FPT7097 chicken leg, but changes color and has a white bone on one end. Measures 4-1/4" long. Description: Brown fried chicken leg that looks as though a bite has been taken when child twists the end of the chicken leg. One side (near twisting end bone) is marked, "CHINA". Measures 4-1/2" long. Description: Brown chicken drumstick with black "grill lines" on the sides. Description: Light brown plastic Chicken McNuggets that is shaped and textured exactly like a real McDonald's Chicken McNuggets. The nugget has a mold seam on the edges. Measures 2" long, 1-3/4" wide, 1" thick. Description: Round dark brown hamburger patty with a mold seam on the edges and textured "hamburger" on both sides. Measures 3" diameter, 5/16" thick. Description: Brown round "magic" hamburger patty that appears to be "frozen" when it is dry, but appears "cooked" when the accessory FPT7279 magic spatula is moistened and patted on the patty. 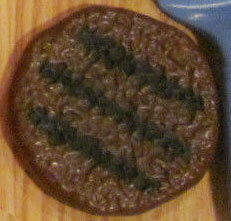 Description: Round brown grilled hamburger patty with black "grill lines" on the sides. Description: Pinkish-red hot dog that is slightly curved, and has slightly split ends. 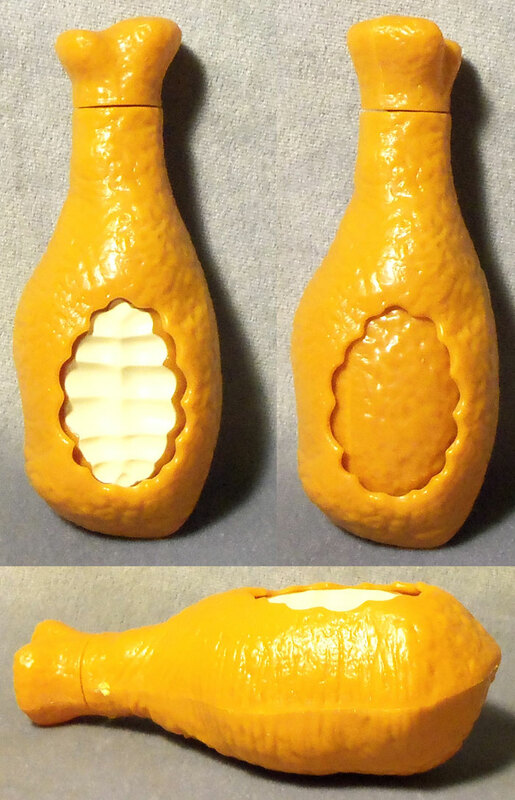 Has a mold seam down the middle (2 long hot dog halves molded together). Description: Brown grilled hotdog with 5 black "grill lines" on the sides. Description: 3 round dark brown meatballs molded together on the sides. Description: Brown square meat chunk. The meat has molded sides that resembles a chunk of steak. The chunk has a narrow slit through the center to allow it to fit onto the #2110 accessory shish kabob skewers. Measures appx. 1-1/2" square. Description: Reddish-brown plastic pepperoni mound. Each mound has 4 slices of pepperoni molded together. Back side of mold is smooth (non-textured) and marked, "©'98 F-P, INC. CHINA". Measures 2-1/8" long x 1-5/8" wide. 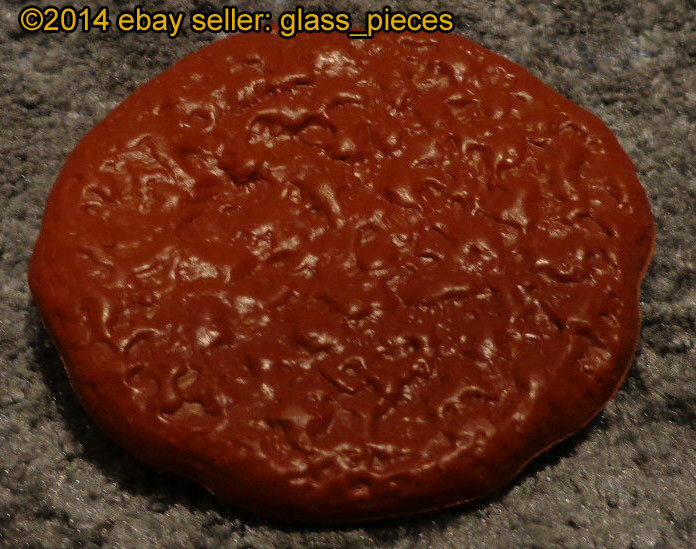 Description: Brown plastic pepperoni mound. Each mound has 4 slices of pepperoni molded together. One side of an end pepperoni has a tiny imprint marked, "KOREA". Measures 2-9/16" long x 1-1/2" wide. Description: Small round dark brown plastic sausage patty that looks like a real cooked McDonald's sausage patty. Description: Brown triangular salisbury steak serving. 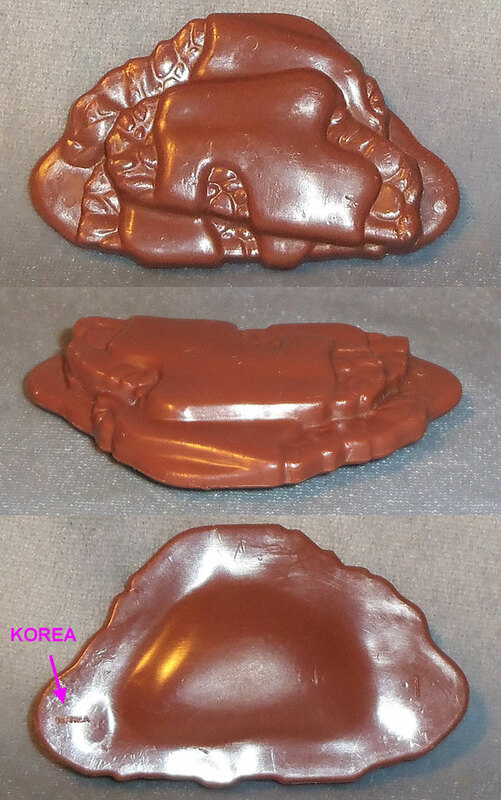 Top side is molded to resemble salisbury steak and gravy, bottom side is smooth (no molded designs) with a tiny imprint marked, "KOREA". Measures 2-1/2" long x 1-1/2" wide x 3/8" deep. Description: Brown plastic piece of thick "magic" steak (1 inch thick) with black grilled lines. The sides of the steak are smooth. When moistened, the steak appear to be "cooked", but "frozen" when dry. Same size/shape as FPT13940 steak, except color. Description: Brown plastic piece of thick steak (1 inch thick) with black grilled lines. The sides of the steak are smooth. Same size/shape as FPT7278 steak, except color.